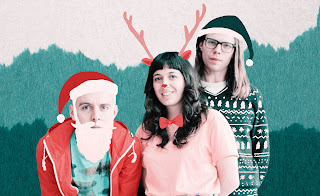 If It's Too Loud...: The Beths Cover "Have Yourself a Merry Little Christmas"
The Beths Cover "Have Yourself a Merry Little Christmas"
Jeff is more of the Christmas music guy here, but every so often there will be one that I enjoy thoroughly. We've both been huge on The Beths (expect them to do quite well in our best of 2018 recap coming soon), so of course we're going to drop everything when they release a Christmas song. They've released their take on the classic "Have Yourself a Merry Little Christmas." The song starts out as traditionally and quietly as possible, complete with strings. But, seeing as it clocks in at over five minutes, it slowly turns into an indie rock epic without losing any of its old timey charm. It's a brilliant version of a classic by a band very quickly becoming one of our favorites. You can listen to The Beths's version of "Have Yourself a Merry Little Christmas" below. For more on The Beths, be sure to check them out on Facebook and Twitter. Current tour dates are below the song, including some early spring North American dates! This place was very comfortable. Restrooms were decent. Coming to LA venue here with my friends was an amazing experience. This is my favorite place now, because of its excellent food, perfect lighting, vibrant atmosphere and great ventilation.